Reports from Halloween Events are coming into the SOS Events home office. We will list a few as there are still several events to report in on Monday. The events have different names but they all were Halloween related. All events were in Florida except the one in Alabama. New Home Baptist 24 decisions, Turkey Creek 14 decisions, Lebanon 16, Avon Park 27. Diana, SOS Events office manager has a SOS Events booth set up in her yard for Trick or Treat. 22 salvations were reported. Eastmont in Alabama had 45 decisions at their Trunk or Treat. That brings the total to 148 decisions and more reports will be in by tomorrow. Praise the Lord for all the decisions made. Pray for the all the new converts that they will grow and learn more about their new life in Christ. 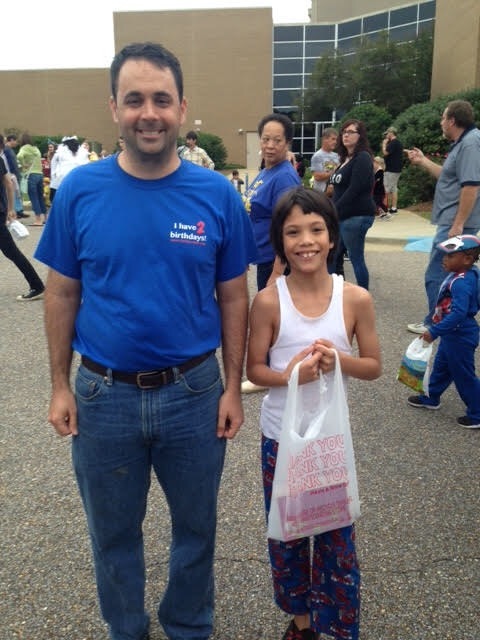 The picture is a SOS volunteer with Jacob, 10 years old, at the Eastmont event. This entry was posted on November 1, 2015 at 12:29 pm and is filed under blessings, Email: info@sosevents.org, Event Activity & News, Witnessing. You can follow any responses to this entry through the RSS 2.0 feed. You can leave a response, or trackback from your own site.